Right so, simple game. All you have to do is guess the pole position time and what driver will take pole. [*]You cannot guess more than once. 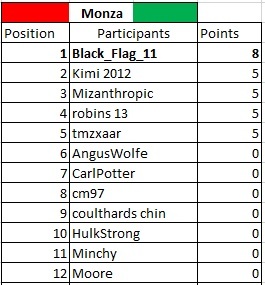 [*]You have up until the end of FP3 to submit your guesses and any after that session will not be counted. [*]All submitted drivers must be current ones. [*]If no time is spot on points will be awarded to the closest time. *Easier than guessing the closest/actual time so less points awarded. 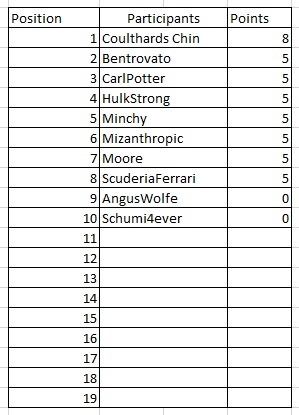 I will update a spreadsheet after every qualifying session and post the results in the thread. Could you please use the seconds format (i.e. 107.573) as it makes it easier for me to calculate the differences. Last edited by Moore on Sun Sep 22, 2013 1:48 pm, edited 4 times in total. Sure, It was just a rough time really. Your suggested time will probably work a lot better. I'm gonna go for a gamble. Hmm I say the Mercedes will be flying this weekend! Hmm... A wet-weather qualy, huh? Hadn't even considered that! 10 participants in total. Hopefully this'll get more people taking part as the rest of the season goes on. You may have been a bit late with the posting of your time but seeing as it's the first round, I'll let it slide. I'll post the results in about 5 minutes. Nil points. Now I know how Engelbert Humperdinck feels. Note: I will be in Rome on the weekend of this race so If I remember I'll post the results whilst over there or when I'm back the following week. 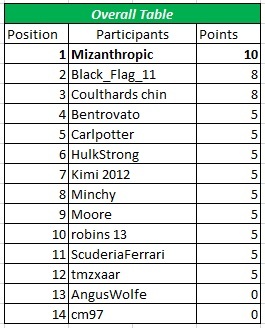 Side Note: Going to look into another scoring system over the next couple of races if we get more participants. 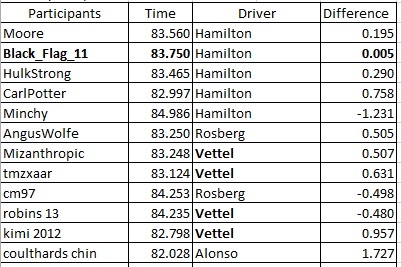 Seeing as it is very hard to guess the accurate times, I'll be looking at doing the closest within 0.100, 0.200, 0.300 etc. And points will be graded depending on your time difference. I might leave it till the beginning of next season though as we've already started this one. 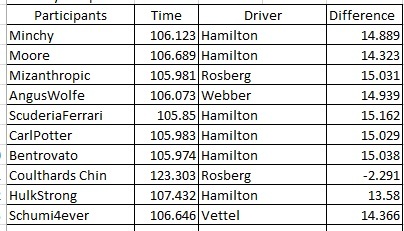 Tried to look for a pattern in speed trap times & Pole positions for 2010/2011/2012, but Vettel was last in 2011 speed traps so anything could happen. I'm joining! Hate to say it, but looks like Vettel & RB will get this one in the dry. His/her guess of 83.750 was only shy of pole position by 0.005! Yet to get the closest time and driver correct in this game. Sorry about the late results but as I mention previously I was in Rome so didn't have chance to calculate the results. Definitely going to consider a new points system though over the next few rounds. If I win the next one, I will see your Victory Dance and raise you a victory EEEAAAAGGGLLLEEE!!! May as well open up the Singapore round now. Last edited by HulkStrong on Sat Sep 21, 2013 10:28 am, edited 4 times in total.